This mod is my reworked version of Cosmetic Armor. The original mod has a few bugs, and it is licensed under MIT License. The author hasn't fixed them, so I figured why not make my own version. This mod allows you to wear two sets of armor, one for display, one for function. You can also hide armor for your skin. For PVP, you can stop the mod from functioning on your client side. 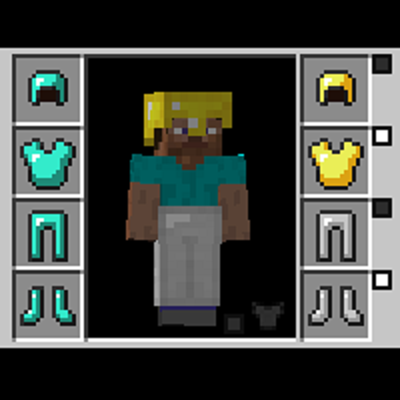 You can press a key (default is set to 'None', you need to change it in Controls under Inventory category) or the button added in your inventory screen (bottom right to your character, similar to the Baubles button) to open the Cosmetic Armor Inventory, left side is your normal armor slots, right side is your cosmetic armor slots. Any armor placed in cosmetic armor slots will not have any effect on you, only for display purpose. They will drop on death. There is a config option to allow you to keep them after death. Little square buttons on cosmetic slots are Skin toggles. When turned on (white), that piece of armor will not display at all. This mod also adds those buttons to bauble slots. When turned on (white), that piece of bauble will not display at all. There is a config option to disable this. Little square button on the left to inventory button is mod disable toggle. When turned on (white), the mod will not work on your client side, this is for PVP. There is a command '/clearcosarmor [player]' to clear one's cosmetic slots. There is an API for other mods to interact with. I rushed coding for this in one day, there might be some issues, reporting them to me is appreciated. Check your server side, the mod also needs to be installed on server for it to properly function. Which version are you using? and forge version. Great, thank you for your report. I will get a fixed version out soon. I love this mod, but could you please explain what you mean by “updated TombManyGraves2 integration”? What was changed, exactly? Didn’t Cosmetic Armor Reworked work with Tomb Many Graves 2 already? The latest TMG2 has changed it's API, it was working because TMG2 also provides updated replacement in it to remedy breakage. This update make the integration part in my mod compatible with latest TMG2's API. If you are not using latest TMG2, you shouldn't update my mod too. sorry to bother you but I don't see any info on the page about this, can I use this in my modpack? I'll be making Youtube videos using the pack and a server for me and my 4 friends. If you want to make sure, check the license. You can use any mod on CurseForge in any modpack on CurseForge. Modpack authors cannot deny you the right to use a CurseForge mod in your CurseForge modpack, because it states in CurseForge’s terms of service, which everyone agrees to when they upload something to CurseForge, that any mod can be used in any modpack as long as both the mod and modpack are on this website. He said for him and his 4 friends. He didn't say he was gonna post the modpack on curseforge or anything. If it’s a private modpack, he can use it. No one can deny you from using their mod in a private modpack, even if you never upload it to Curse. Legally, you can use any mod in your private modpack and even modify it if you want. The only time it’d be illegal is if someone uploads a modpack with a CurseForge mod that doesn’t have a specific license publically on a non-CurseForge site or they modify a mod and release it publically without permission. Amazing mod, thanks a lot for all the hard work ! It's so good to be able to wear anything visually appealing without having to give up on armor ! Lots of love and I wish you the best ! Edit: Oops, wrong mod page ;9 This is what happens when I'm looking at too many things at once. Great mod, thanks for the hard work! Umm, I think you are posting in a wrong project. Thank you for this very nice project. - Please does your mod is compatible with https://minecraft.curseforge.com/projects/baubles ? No conflict/bugs ? I would like to be sure :).